Disinfect surfaces while leaving them with a fresh, lasting scent with this Lysol Country Scent Disinfecting spray. 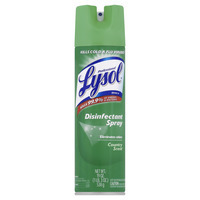 The cool and crisp country scented Lysol Commercial Aerosol Spray is used to prevent odors and growth of mold and mildew. CFC's free spray is tuberculocidal, viricidal, fungicidal and bactericidal. Hospital-grade disinfectant/deodorant is extremely effective against TB, MRSA and HIV-1. 19 ounce spray can. Sold as 12 per pack.